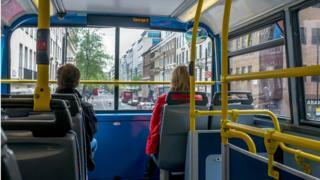 The number of people travelling by bus has dropped by nearly 100 million over the past decade, according to figures. Scottish government data showed that while the number of air, rail, ferry and car travellers all increased, bus patronage declined steeply. There were 388 million journeys by local bus services in 2017/18, down from 487 million in 2007/08. There was also a 13% hike in the number of cars registered in Scotland since 2007. Despite buses accounting for three-quarters of all public transport journeys, the sector has suffered as a result of soaring fare prices and increased road congestion. A shakeup of the way bus services in Scotland are organised is planned, with campaigners calling for councils to be given more powers to fill gaps in the network. Gina Hanrahan, head of policy at the pressure group WWF Scotland said: "Transport is Scotland's biggest source of damaging climate emissions and these figures are firmly going in the wrong direction. "Air travel and car travel are at their highest ever recorded levels, while bus use has fallen and cycling has seen a 6% drop over five years." The latest Scottish government transport data showed there were three million motor vehicles registered in Scotland by the end of 2017, contributing to a 31% rise in traffic since 1995. Despite the increase, there were 146 road casualties in Scotland in 2017/18, the lowest number since records began 50 years ago. On the trains, there were 97.8 million ScotRail passenger journeys in 2017/18 - a rise of 3.8% on the previous year. Scotland's airports attracted 29 million visitors last year, up 7% on 2017 and 15% higher than the previous peak in 2007. The number of people travelling by bike also fell over the past five years, with just 3% of people now commuting by bike. That was despite a near doubling of the funding available for infrastructure to support cycling. In total, 525 million public transport journeys were made in 2017/18. Transport Secretary Michael Matheson, said the statistics illustrated the importance of current moves to develop a more sustainable transport network in Scotland. He added: "I believe that through the steps we are taking to empower local authorities and support greener travel, we can work together to shift behaviour by encouraging more people out of their cars and on to public transport, walking and cycling. "Although the majority of public transport trips are made by bus, I remain concerned that bus use continues to fall - and this is a trend we see across the UK. "We are continuing to spend over £250m a year to support our vital bus industry, working with operators to keep fares at affordable levels and providing free bus travel to older and disabled passengers."